Is Real Estate Print Marketing Still Relevant? With many real estate brands having turned their marketing focus and budgets online, is traditional print marketing still relevant? We think so. Print marketing is still a powerful and necessary component to effective real estate brand building and one that most real estate marketers should consider. To supplement your online marketing initiatives, print offers a great platform to solidify your real estate brand identity, and keep it in the forefront of your market’s thoughts. The more brand exposure across diverse media the better. 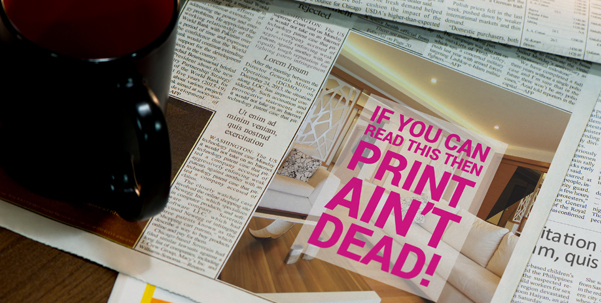 Print provides a sense of credibility. Paging through and interacting with a printed brochure for example makes your brand tangible, personal and thus creates trust within the market. Magazines often hang around in homes and offices for weeks or even years, whereas online banner ads for example will disappear as soon as you cut your ad spend. This is where a visually well designed brochure printed on good quality paper, for example comes into its own. If it has been designed well and appeals to your target audience, they are likely to hold on to it for longer. The same principal applies to both online and print marketing. People respond to beautiful and well thought out design and are more likely to engage if the visual communication they are exposed to appeals to them. There are clever ways of connecting your print and online marketing and one of them is the QR code. Placing a QR code on your property listing in for example the Sunday Newspaper, can easily direct a potential buyer to the listing on your website where they can view further details and images on the property. Whereas online marketing is often function driven, print marketing such as adverts and brochures are all about creating a positive emotion towards your brand within the market. At the end of the day, the best way to market and build your real estate brand is to utilise as many channels as possible. Most emphasis these days is likely to be online, but do not discard print completely. People still see value in holding and interacting with printed material. It is important to find the right balance between the two.